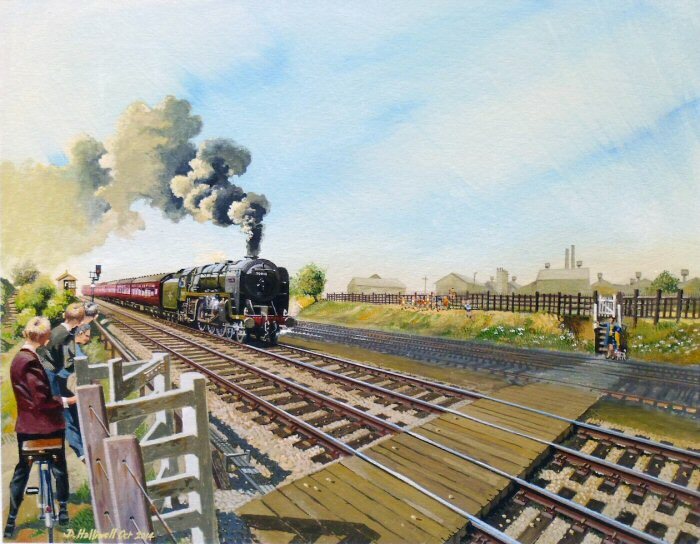 “Whitley Crossing” – Oils on canvas board. – Size: 50cm x 41cm. “Fire in the sky” – Oils on canvas board. 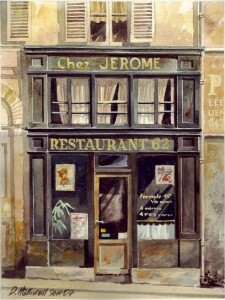 – Size: 41cm x 31cm. 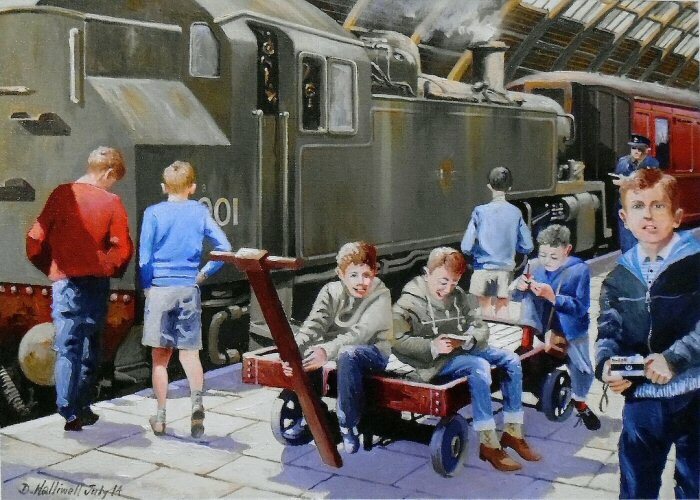 “School Holidays” – Oils on canvas board. 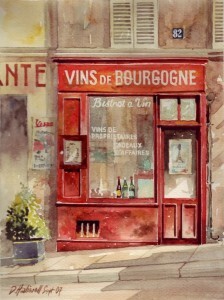 – Size: 41cm x 31cm. 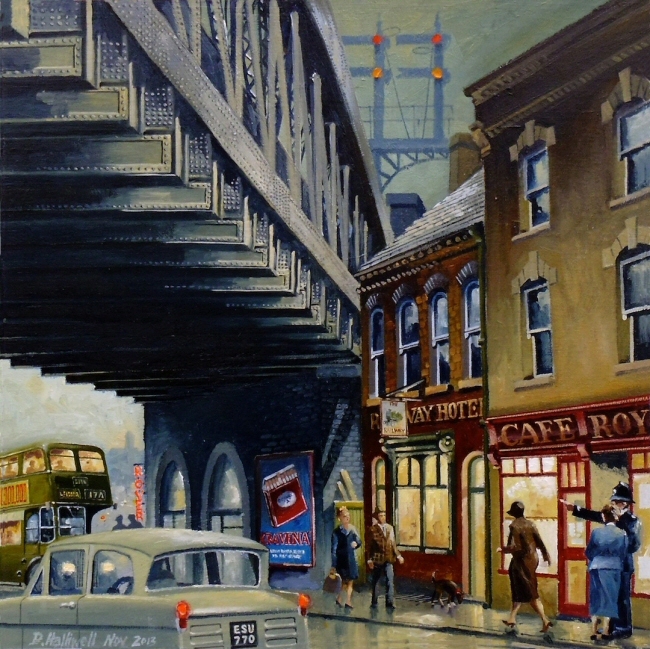 “Holding up the traffic” – Oils on canvas board. 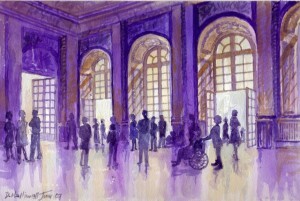 – Size: 41cm x 31cm. “Going to Work” – Oils on canvas board. 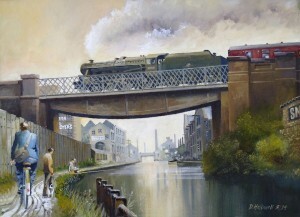 – Size: 41cm x 31cm.The Grand Union Canal, Leicester in the 1960’s. 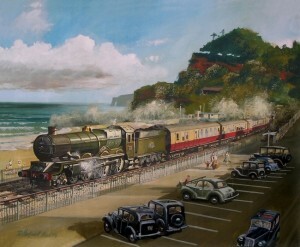 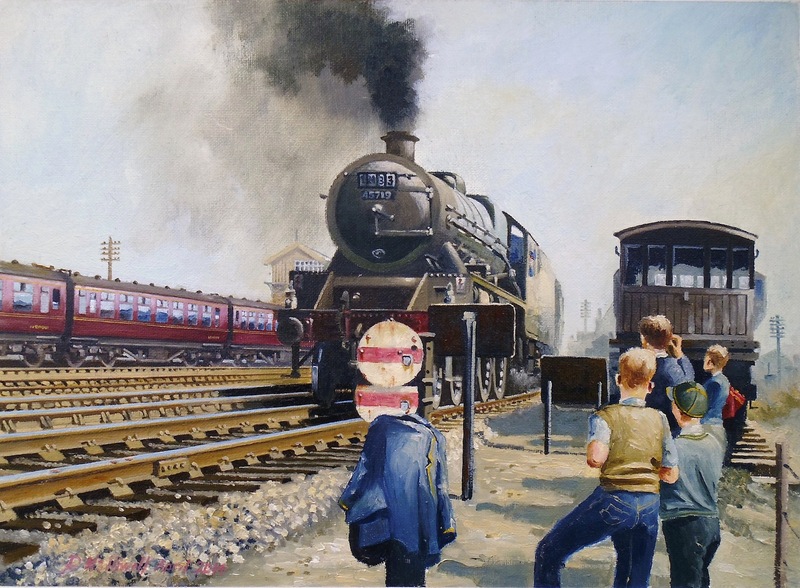 “Trainspotters” – Oils on canvas board – Size: 41cm x 31cm – You can’t get this close these days. 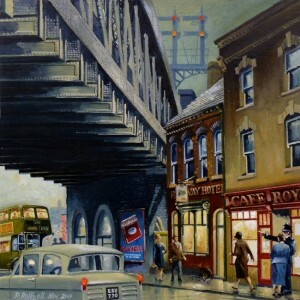 ‘Gangers at Weekday Cross’ (above) – Gouache. Size 24ins x 12ins – Gangers are the men who maintained the railway tracks. Their official name was a ‘Permanent Way Gang’. The permanent way being the track, and so you have ‘gangers’. 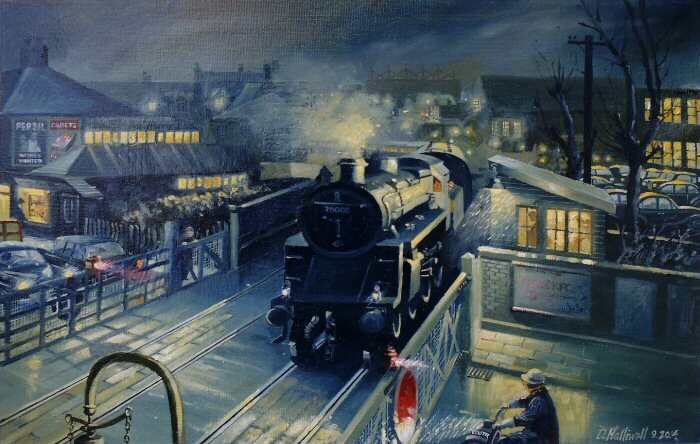 In those days they carried on working even when the trains went by, no Health & Safety then, just a man with a red or green flag. 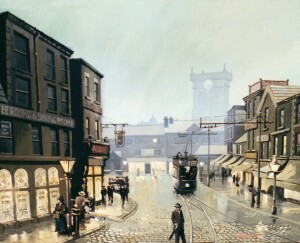 Weekday Cross is an ancient and historical part of Nottingham, near the old Lace Market. 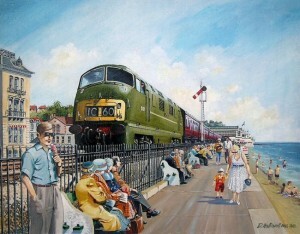 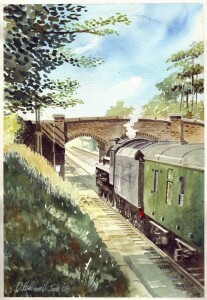 “A Grand Day Out” – Gouache on canvas board. Size 50cm x 40cm. 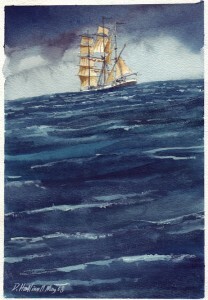 “Happy Days” – Gouache on canvas board. 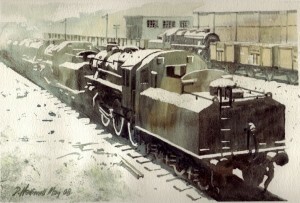 Size 60cm x 46 cm. 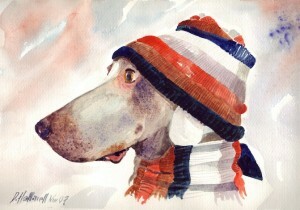 “First Snow” – Gouache on canvas board. Size 60cm x 46 cm. 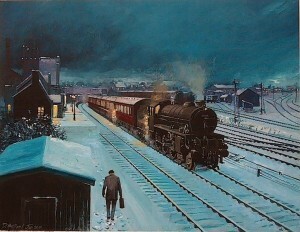 “View from Wigan North Western signalbox on a foggy November day in 1962” – Gouache on canvas board. 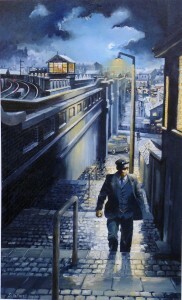 – approx 60cm x 30cm. 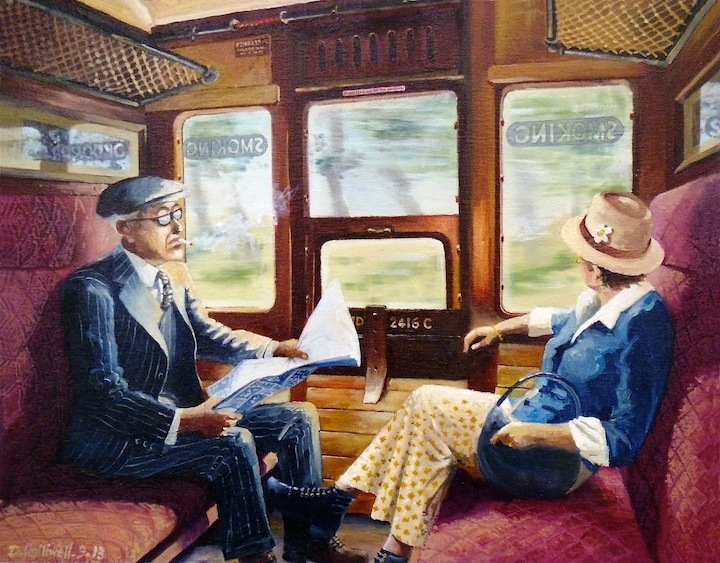 “Day Trippers”-Oils-50cm x 400cm-Reminding us of how even basic comfort on the old trains was more preferable than some of the offerings we have today. “Rush Hour”-Gouache-50cm x 40cm-The city of Bath in 1961. 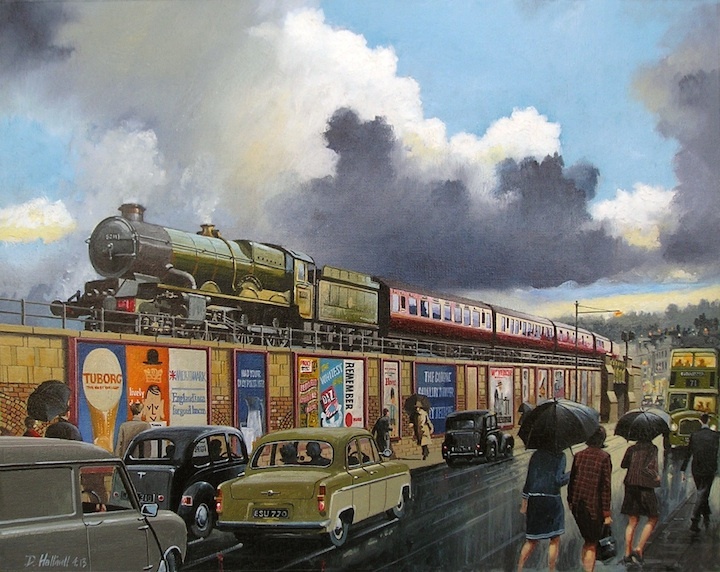 There’s rain in the air as a train heads for London and some office girls run for the bus. 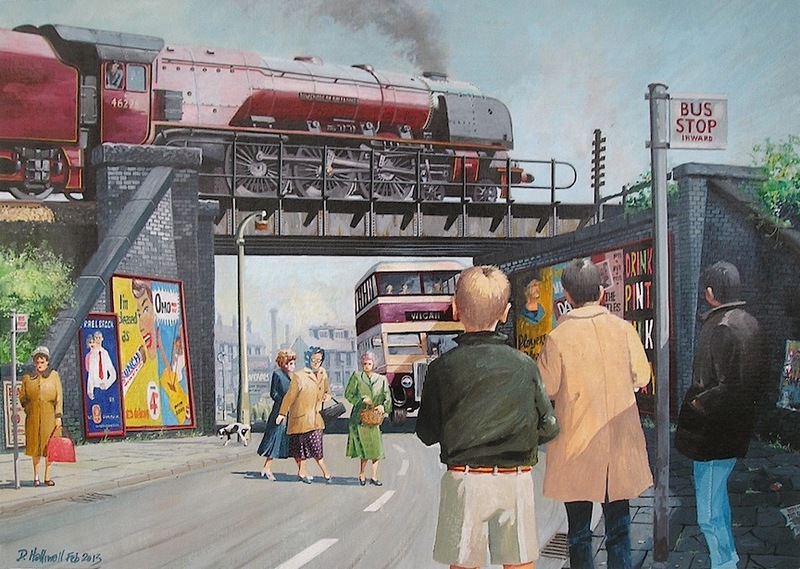 “Waiting for the bus” – Gouache-50cm x 40cm-There you are, waiting for the bus and this big red engine rushes over the bridge and is gone in the blink of an eye. 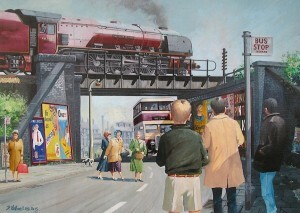 Such an everyday event no-one took any notice! 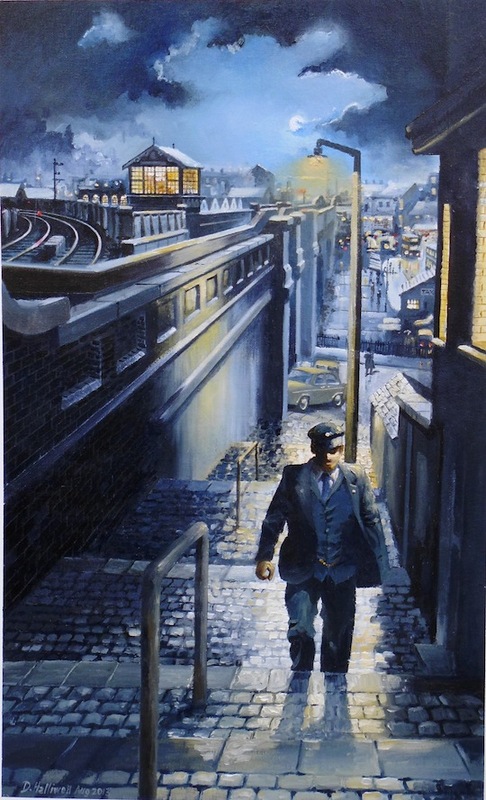 “Weekday Cross”-Oils-60cm x 38cm- The location is Weekday Cross in Nottingham as a railway worker heads for home after a late shift. 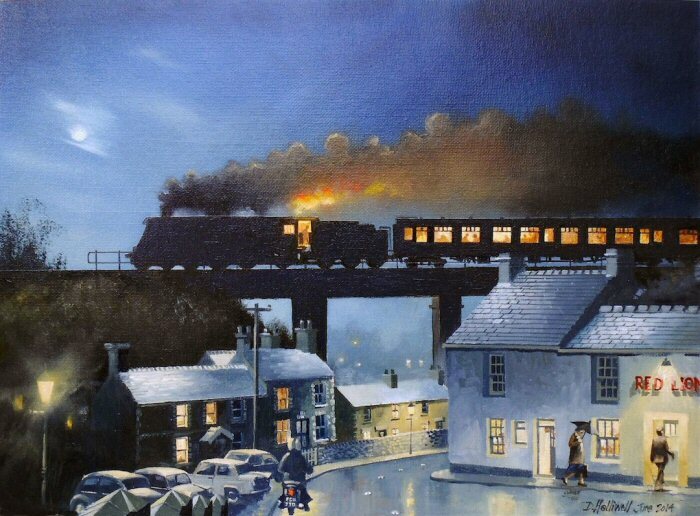 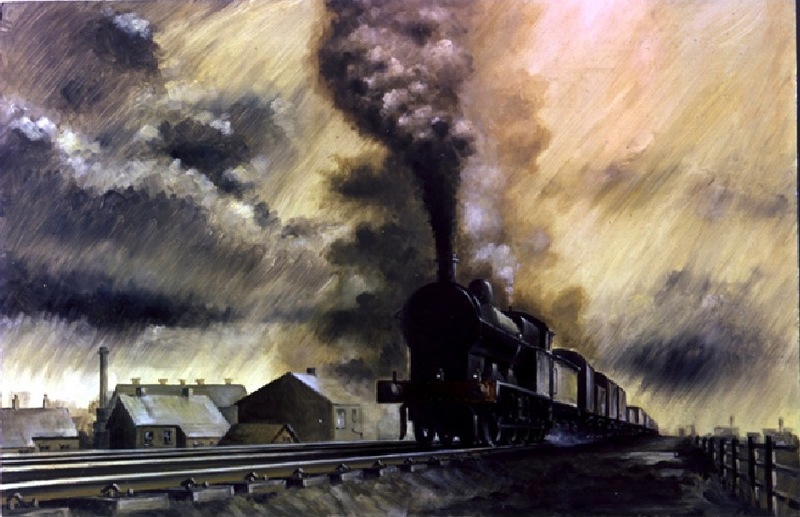 “Returning the Empties” Gouache – 32″x24″ In the days when coal was carried by rail, a rake of empty coal wagons returns to the pit head. 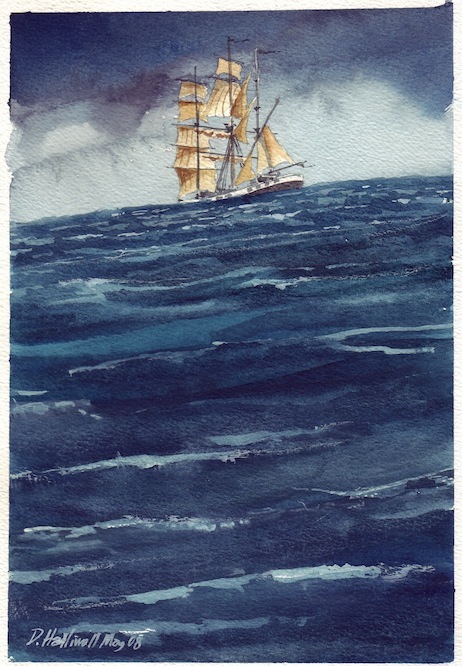 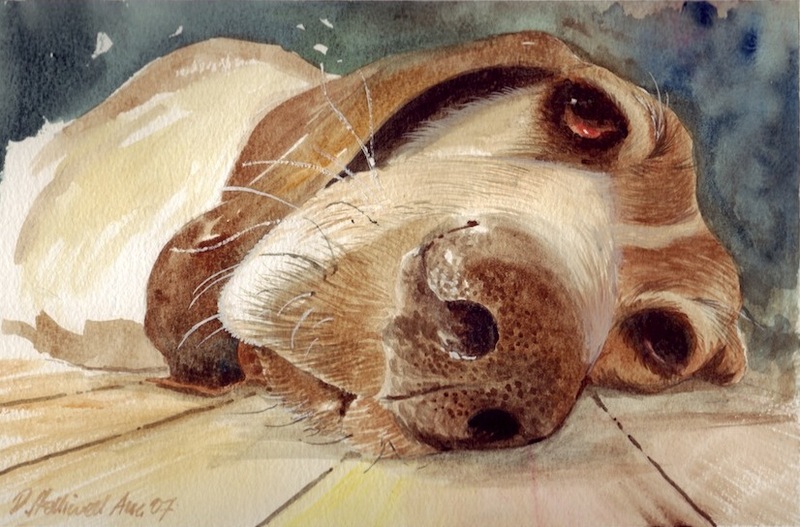 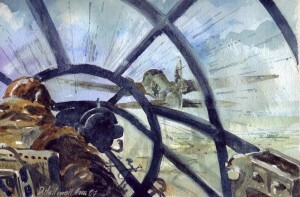 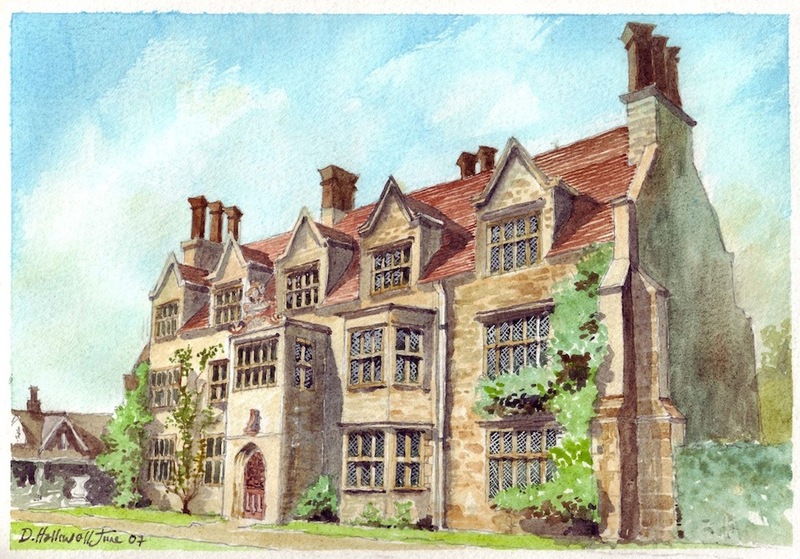 “Target in Sight” – Watercolour Well, every boy wants to draw aeroplanes…. 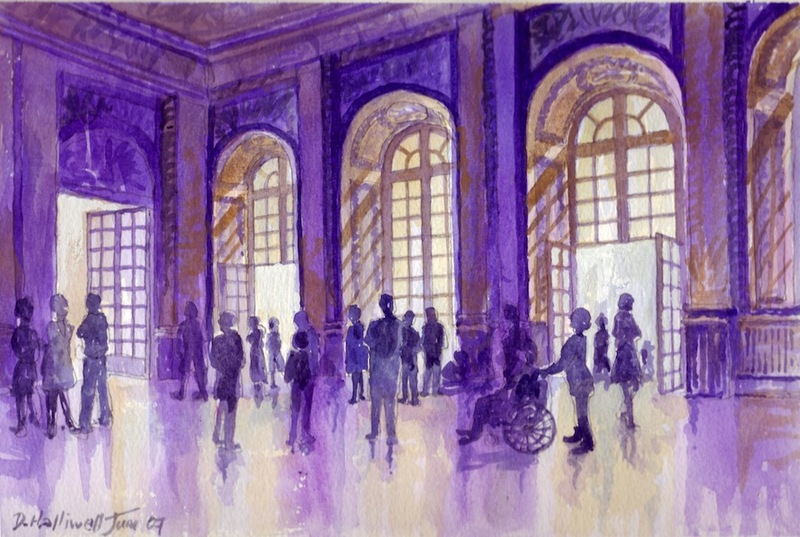 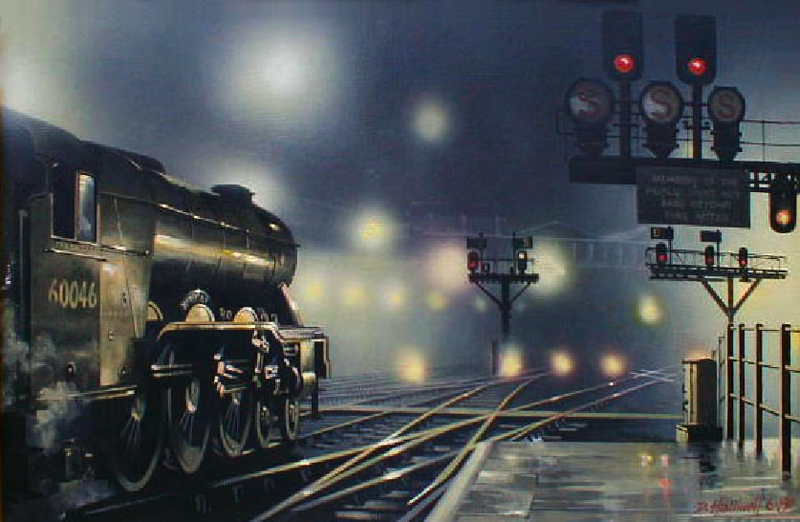 “St Pancras” = Gouache – 24″x18″ Misty background achieved using a can of acrylic car aerosol from Halfords. 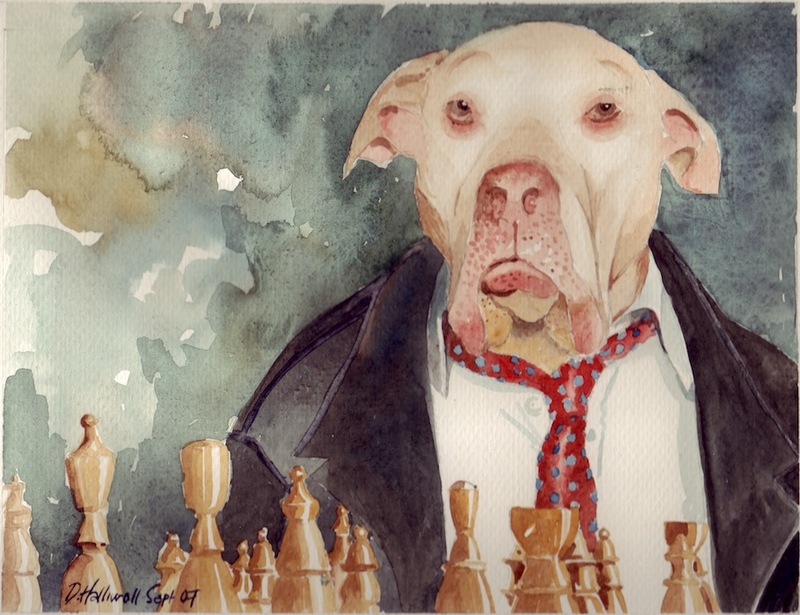 I don’t mind mixing my media! 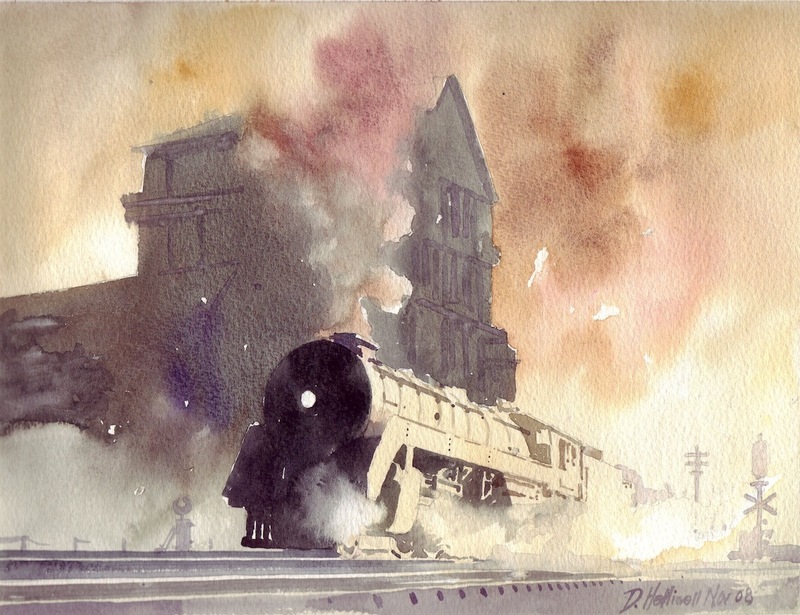 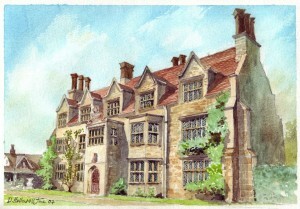 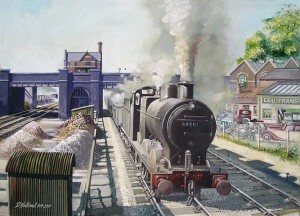 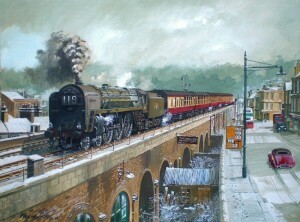 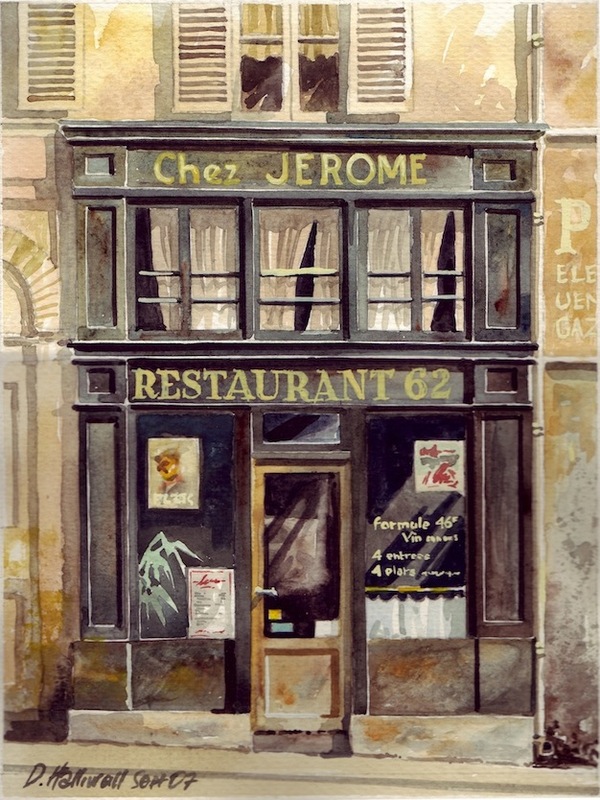 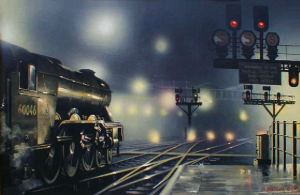 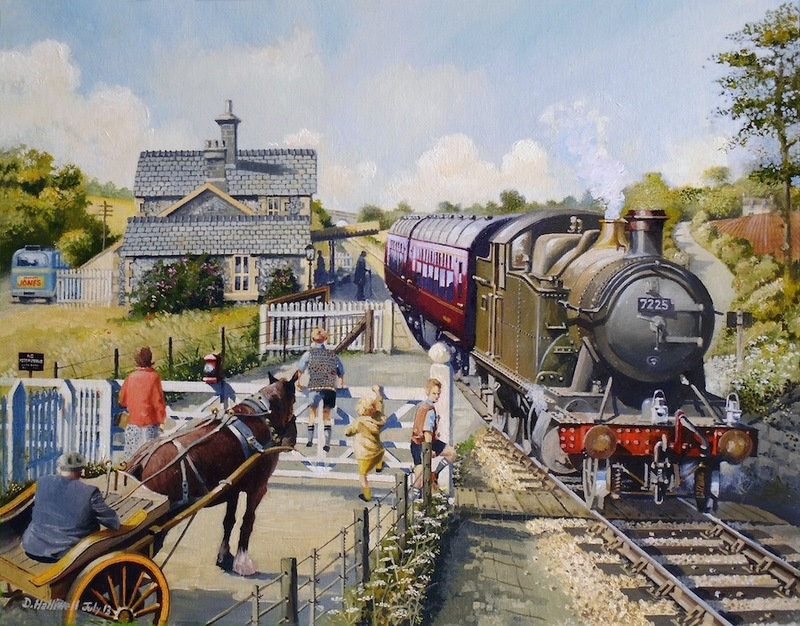 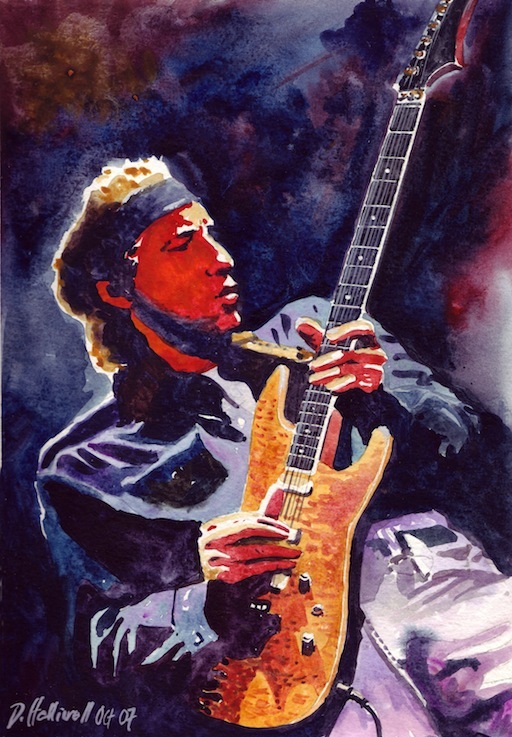 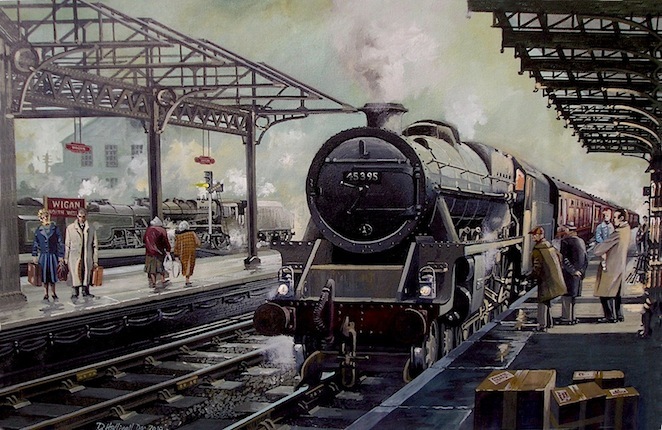 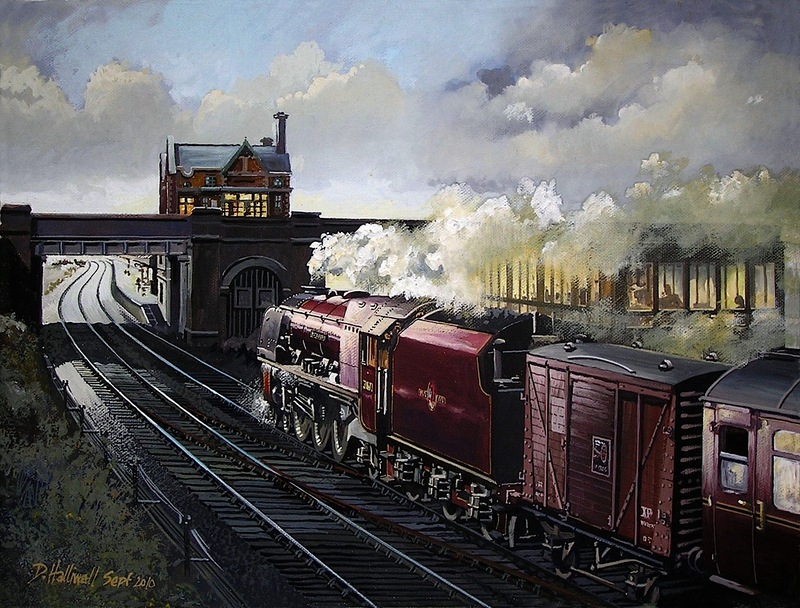 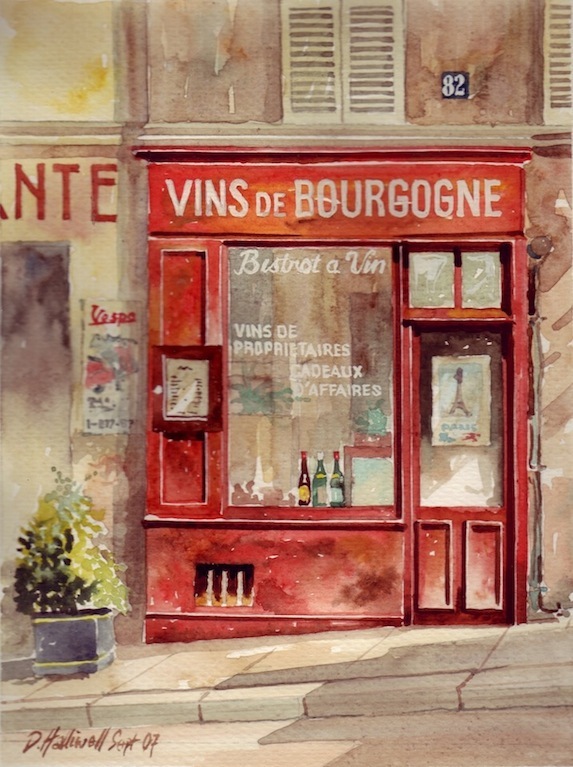 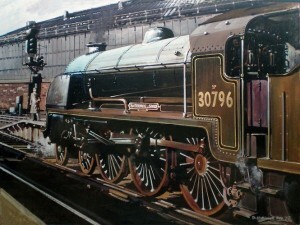 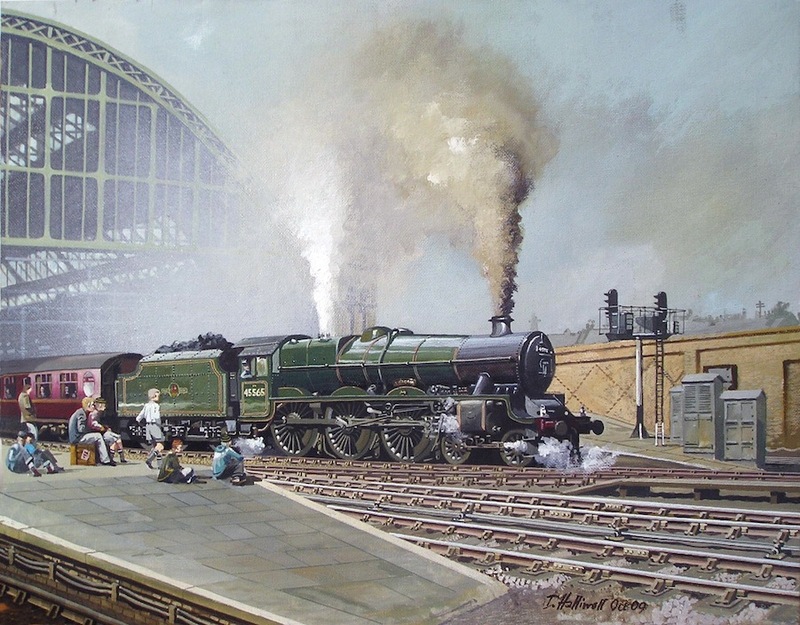 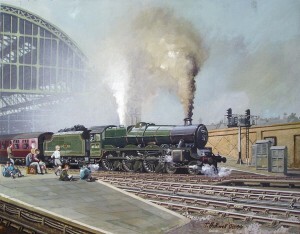 “Kings Cross” – Gouache – 18″x12″ – The foggy effect in the background was achieved using an airbrush. 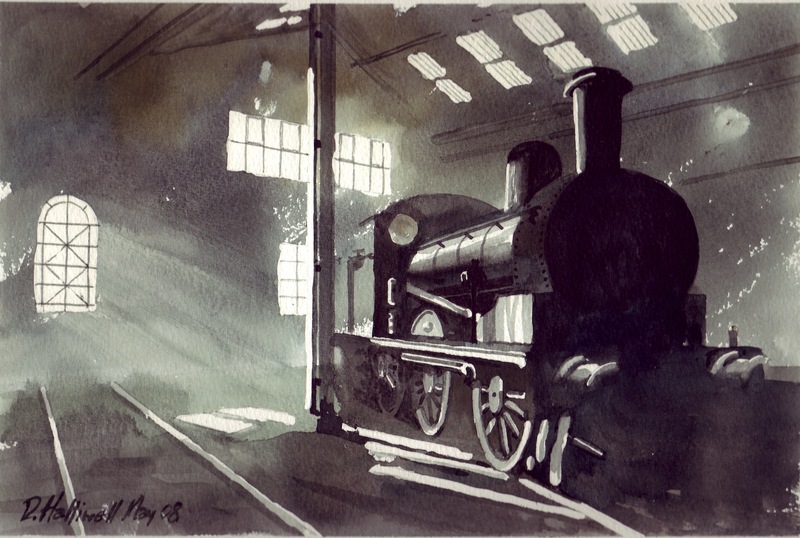 “At Rest” – Watercolour – 30cm x 22cm approx – Inside the smokey confines of a steam locomotive shed.